One place where no one can accuse the Pilots of being cheap was in placing newspaper ads. Whenever I travel to another American League city, I always stop by the library and look in the newspaper collection, but I haven't found nearly as many ads as I have in the Seattle Times and P-I. I don't expect this gallery to grow very quickly, since everything here was copied from microfilm and removing the dust and scratches is long and tedious work, but in the meantime, please enjoy what I've finished so far. 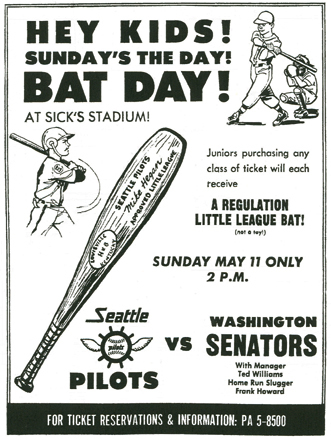 The Senators edged the Pilots, 6-5. Read the box score!